In my last post, I covered a basic NVMe VIP test-case including some basic setup, sending a command and receiving a completion. Here, we’ll look at a few more NVMe commands, touching on some of the features and capabilities of the VIP. Here’s where you can learn more about Synopsys VC Verification IP for NVMe and for PCIe. The NVMe VIP provides a set of feature to assist in testing. These include randomizations, feature snooping, simplified PRP and data buffer handling, memory fencing and built-in score-boarding. We’ll look at each of these in turn with another example. Following up on our “trivial test-case” from the last post (again, we are not showing some of the task arguments or checking errors), let’s take a look at a few more commands to get our NVMe test case rolling. Just a reminder: the tasks that start with the word Script are NVMe commands. The others (that don’t start with Script), are a VIP status/control/configuration task. We ended our last sample with a call to Identify Controller. Now, continuing at that point, we read bytes 519:516 to get the number of valid namespace IDs. We hand that to the host VIP with the SetNumNamespaces() call. Note that we had to byte-swap the (little-endian) data returned in the Identify Controller buffer. // identify buffer. Note index converted from bytes to dword. Next we read the information for one of the namespaces (Namespace ID=1). Note that we “cheated” a bit here, as we should have walked all the valid namespaces. For the example we’ll just assume we have only NSID=1. Although the Identify calls don’t take a PRP list, their host memory buffer can have an offset. If this is desired, select the argument “use_offset=1”. The actual offset is randomized via the constraints MIN/MAX_PRP_DWORD_OFFSET_VAR. The next steps format our namespace (using Format 0 in the Identify Namespace data structure). We then update the VIP view of the namespace information. The VIP needs this namespace information to keep a per-namespace scoreboard. We next create a pair of I/O queues. Since the submission queue requires its companion completion queue to be passed along with it, we create the completion queue first. Note that queue creation routines take an argument contig. If contig is set, the queue will be placed in contiguous memory, otherwise a PRP list will be created for that queue. In addition to creating the actual queue, the VIP creates a fence around the queue to verify memory accesses to the queues. Attempts from the controller to (for example) read from a completion queue will be flagged as an invalid access attempt. The actual queue IDs are randomized (within both legal and user-configurable constraints). Once we have I/O queues created, we can start doing I/O. Using the ScriptWrite() and ScriptRead() calls, we send data to the controller and immediately retrieve that same data back. The underlying data structure of the data (in host memory) is built automatically by the VIP. Note the use_offset argument (as with our queue creation tasks) to control whether we generate PRP and PRP List offsets (controlled by MIN/MAX_PRP_DWORD_OFFSET_VAR and MIN/MAX_PRP_LIST_DWORD_OFFSET respectively). Due to our built in score-boarding, we don’t have to compare the data read from that written, the VIP is checking data returned against its shadow copy that is tracking successful VIP writes to the controller. // Do what you’d like with the rbuf (that’s the data we just read). Hopefully that’s gotten us through most of the basics. You should have a good feel for the operation of the VIP. Again, many of these tasks have more arguments allowing more control and error injection, but our goal is to get through without dealing with the more esoteric features. If you have the VIP handy, feel free to walk through the examples: they should look quite familiar. In my next post, we will look into actually testing a controller, especially going into features like error injection. As always, thanks for joining us. See you again soon. 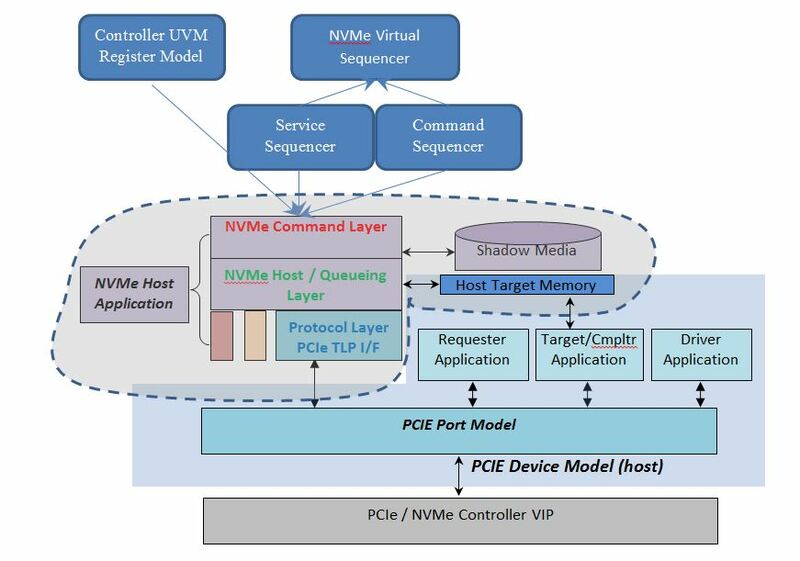 This post is filed under Methodology, NVMe, PCIe, UVM.